Robert Benton has become the latest outstanding young American euphonium player to become a Besson performing artist. I am personally delighted that Robert has been welcomed by Buffet Crampon USA to help us to promote Besson instruments. He is a great soloist and excellent ambassador for the euphonium. 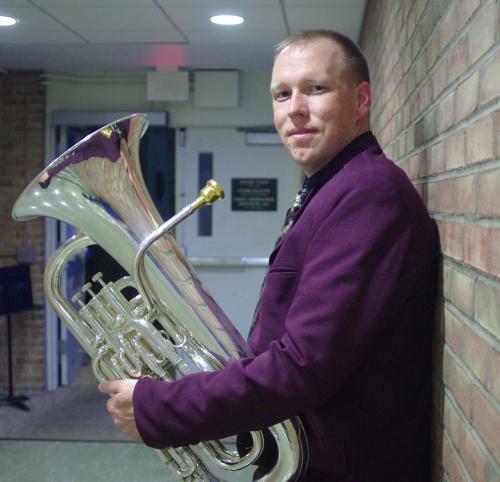 Robert Benton, a compelling performer in the emerging generation of euphoniumists, is currently completing his Doctorate of Musical Arts in euphonium performance at the University of Michigan. Robert also holds a Master's degree from Michigan State University and a Bachelor's degree from Oakland University. His primary teachers have been Kenneth Kroesche, Steven Mead, Phil Sinder, and Fritz Kaenzig. Robert is an avid educator, and currently holds teaching positions at Adrian College, the University of Windsor, and the University of Michigan, as well as maintaining a successful studio of area high school students. As a performer, Robert has been active as a recitalist and concerto soloist throughout the United States and Canada, as well as in Europe and Asia. He has recently performed concerti with the Michigan State University Symphony Orchestra, the Jeju Philharmonic Orchestra (Korea), the Capital City Brass Band and his own military unit, the 338th Army Band. As an ensemble musician, Robert has enjoyed close relationships with the Michigan State University Wind Symphony and the University of Michigan Symphony Band, and was recently invited to play with the world-famous Brass Band of Battle Creek. Robert garners accolades wherever he goes, winning several concerto competitions at Oakland University and Michigan State. In 2008, he competed in the Jeju International Wind Ensemble Festival Brass Competition, where he was a finalist. Prior to that, Robert performed in recital at the 2008 US Army Band Tuba-Euphonium conference in Washington D.C. In 2006, Robert received the Stanley Hollingsworth Overseas Study Grant which enabled him to travel to Manchester, England to study with the world-renowned euphoniumist, Steven Mead. Devoted to new music, Robert is active in commissioning and premiering new works for the euphonium in a variety of mediums. Recent commissioning projects include works by Joel Puckett, Ricardo Lorenz, Steven Bryant and Peter Meechan. Several of these pieces will be recorded on his upcoming CD project, which will be released in the summer of 2011. Robert's plans for the future are to promote the euphonium as a solo instrument not only through concerts, competitions, recitals and recordings, but also by training the next generation of tubists and euphoniumists as a teacher at the university level.